So, the other day, I made a card using this layout and I wasn't sure about it; the card, the layout, something didn't sit right for me. But you all left such lovely, encouraging comments, I thought I'd have a play with it again. I've had this Easter Stamp sitting on my desk for a little while (sorry girls) and she was just shouting at me to be inked up. I've also had this green polka dot paper lounging on my desk begging to be used and so the three things seemed to fall together nicely. 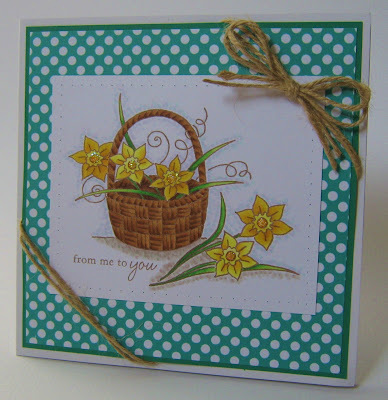 I love daffodils and without the Easter sentiment I thought that the image might make for a nice Get Well card. I couldn't find a Get Well sentiment to fit where I wanted it, so I used this one instead. Coincidentally, the new challenge over at My Mum's Craft Shop this week is Flowers and if you play along this week, you could win this fab Marianne Design Creatables Chinese Rose. Hop on over for all the details! On Sunday, we gave Sweet Cheeks the egg that The Easter Bunny left for him. As he loves all things car related, (he's slightly OCD about Tractor Ted again at the moment.) it stands to reason that the egg is/ was car shaped. His little face when I handed him this big car, and then he realised it was choklit. Ooooooooh Choklit, he said. That's my boy! Oh what a gorgeous card. That image would make a great get well, mothers day too. Oh lovely SC and his car shaped egg, I can just imagine his little face....Sweet! c) boy, your colouring is great! The basket looks real! PS. I refuse to think how much choklit my kids (AND me) have consumed in last days. If I block it out, it hasn't happened. Just PERFECT!!! Wonderful card with a great image - and you always use the most fantastic patterned papers. glad to hear you had a fabby easter and SC loved his choccie card lol...yum yum..
Gorgeous card Faye! Love the polka dots and the string!!! Lovely image - ofcourse! Beautiful colouring. Oooohhh, I want to try those copics! Gorgeous spring card Faye, I like the way you have coloured the daffs. Love the daffs and the little bit of stringy. Thats my grandson. Getting his priorities right. Oh this is LOVELY!!! I think it's a fantastic layout and I love the green and yellow together. Beautiful shading!! Congratulations on the new DT role. This is a lovely card - very fresh looking and pretty, and very well balanced. Wonderful card Faye..I do love the dotted bg with your lovely image. The coloring is really beautiful! Oh this is beautiful Faye and love the string. Cyber-sis, I LOVE this card, daffs are my most fave flower (obviously!) and you've coloured this image be-U-tifully and the sentiment is perfect. This so so pretty Faye! Love the polka dots! So striking! The twine and the flowers are perfect too! Oooooh love this layout with the twine in the corners, mmmmmmmm! hope sweet cheeks enjoyed his choklit!